To all of you in the Ultra Tec family. 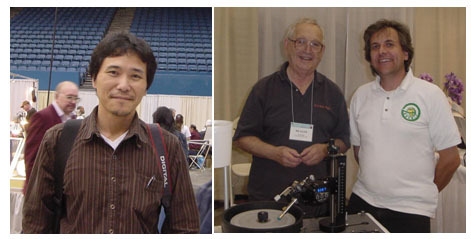 We want to thank the folks who came by to visit us at the Tucson Gem and Mineral Show. We were in the Convention Centerthe old time main showa location I still like. We approached it with some trepidation  we hadnt been there the year before, and wed heard the stories of how slow it was in 09  with the economy teetering so badly. This year  Im happy to say, it was busy for us (and most of the dealers around reported much much better than last year). We were introducing the Concave and Fantasy machines, and for many of the Ultra Tec faceters coming by, it was an introduction to the DADand all of that drew pretty constant attention. Robert Mendoza and I worked the show  Robert demonstrated the mounting of the DAD  thats what he was doing in the photo (hes with professional cutter Pat Kelley in the picture  Robert on the left. Pats an old time Ultra Tec faceter, and now a new DAD owner). One very nice thing about The Tucson Show is that it gives us a chance to visit with some of our far flung Ultra Tec Representatives. And, you could hardly get more far flung then the two in these pictures  one from about 6000 miles to the west, Hiroki Hori of Japan, the other from about 6000 miles to the east, Hubert Heldner of Switzerland. Nice people  good friends  super faceters. 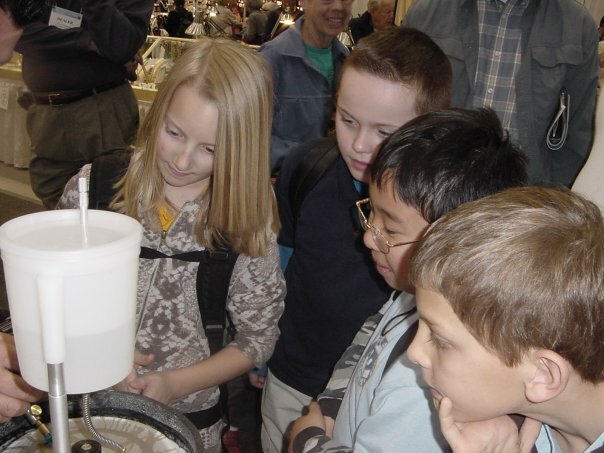 For may years, the Gem and Mineral Show with the cooperation of the Tucson schools, designates a special day for the kids of Tucson. Its an educational event that the kids really enjoy. It means opening an hour early on that day, and some dealers grump about it  but it is something that I really enjoy. 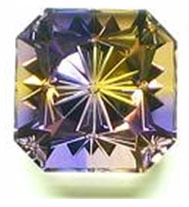 We always set up a faceting machine where we can invite the kids to cut a facet or two. Seeing their faces light up is wonderful. Its nice when some kid sneaks back from his group and says Hey, that was great. Can I do another one? Of course the answer is yes and I let that student know that she (this years most persistant young faceter was a girl) is gooood! When I offer them a steady job at faceting -- skip all that school stuff -- they generally retreat (not always). Spectra has become the most popular of the Ultra Laps --and if youve been trying to get them recently, youve learned that they are in short supply. That sparked a situation in which people were doubling up on orders (a run on Spectra)  and weve had a short period of being out of stock. But--we do have them in stock right now, and were coping with it (but yes, its moving quickly). Spectra is a special milling of Cerium Oxide, and is specially good for Quartz materials and Beryls. 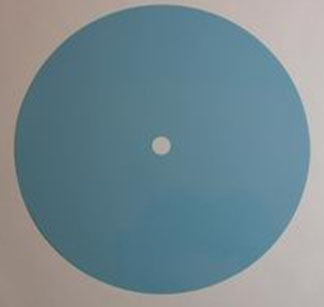 Now, its hard to take an exciting picture of a lap  but Spectras distinctive blue color identifies it  so heres a pic. We supply Spectra in packages of 10  typically an Ultra Lap will do a number of stones (I used to get rid of them if some of the polish material skived down to the plastic film carrier, but Ive learned that they can be continued in usethe skived edge being quite effective in polishing. The 10 piece SPECTRA package is item number M8101 and is $25.  these are all packages of 10  all $19/pkg. This article is from the USFG March newsletter. 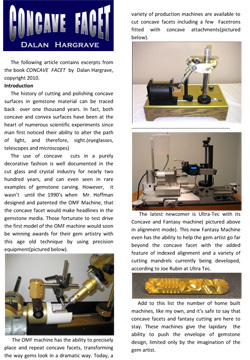 It is written by Dalan Hargrave, an expert in the world of concave and fantasy gemcutting. . The article provides an overview of the available equipmentincluding Ultra Tecs relatively new entry into the field. Dalan Hargrave combines exceptional imagination with innate good taste  the results speak for themselves. 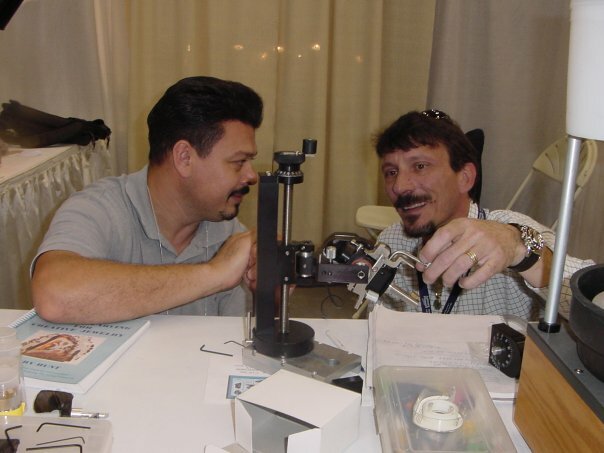 A goldsmith for 25 years, he says that he became fascinated in watching someone working on an Ultra Tec  it was 12 years ago -- and it turned his attention to faceting. A friend gave him an old faceting machine, and, as they say, the rest is history. He now reports dividing his time about 50-50 between goldsmithing and lapidary. Dalan characterizes himself as a tool guyand he has an array of faceting machines, including a home-made one, and a more recently acquired Ultra Tec. 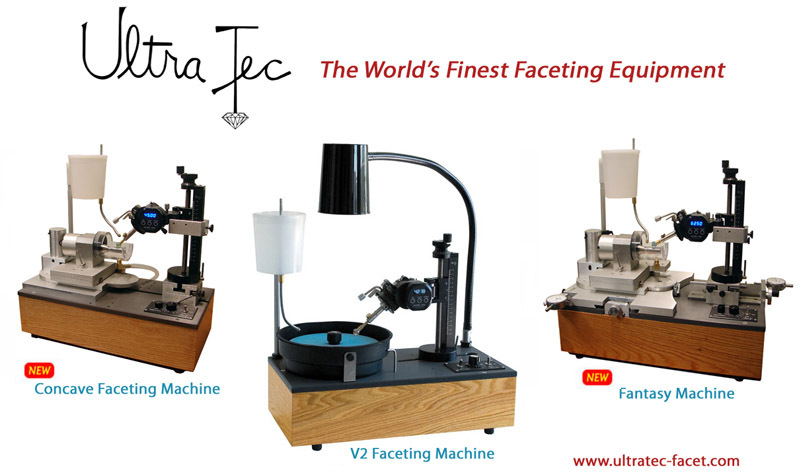 Ultra Tec Faceting is now on FACEBOOK. Take a look at our page for interesting links and updates. We welcome all our Ultra Tec cousins as FANS -- your, pictures, experineces, comments and suggestions are welcome. We'll be in touch again soon with the next Sometimes Bulletin.